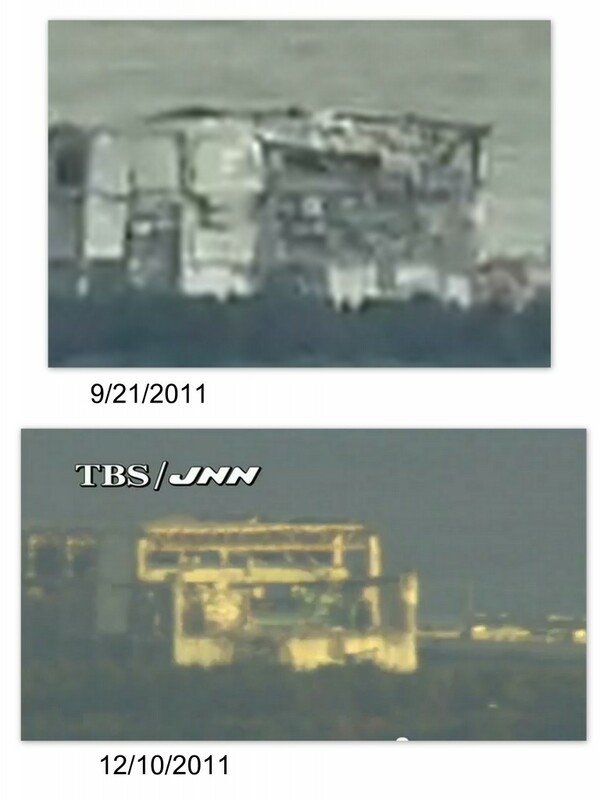 Fukushima Diary reports "it was confirmed that the wall of reactor 4 was lost on the south side. At least since 12/5/2011, the wall is missing." SimplyInfo believes it looks like it was deliberately cut because it is so clean. I (artnuke) think it's wierd it could have come done so fast and clean without an annoucement and nobody noticing since that section is the size of a high school gym and there isn't any way for machines to get in there to cut up the steel beams of the roof to be lifted out, and the concrete pillars are so thick you'd need to sever them with explosives if you didn't use a wrecking ball or snippers. I've only seen these two reports and nothing else in the press, we should have heard from TEPCO or the Japanese government as a collapse would be truly troubling. - OK I see the pictures, the snippers they have were strong enough to cut the pillars. Contrary to what you may have heard, the rumor of the collapse of Reactor 4 is, for now, just a rumor. What you have instead is the result of a planned cleanup/demolition by TEPCO. 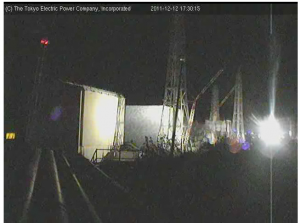 Several readers of my blog sent me the link that shows photographs of Reactor 4 at different times in December and links to a post that claims Reactor 4 is falling apart. Alarmed, I started looking for information. 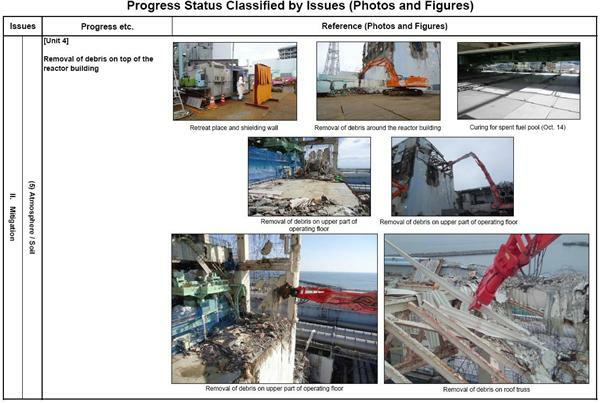 There was absolutely no news or rumor of that in Japan, not even in the Internet message boards on the Fuku-I disaster. I looked at the photos again. I noticed that part of the ceiling trusses were gone, and it looked they were removed systematically. 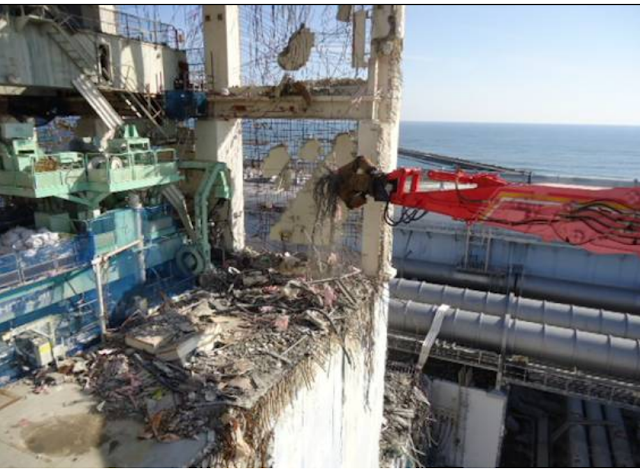 In Reactor 3, they are removing the debris on the operation floor using a crane. It will take a long time still. In Reactor 4, they removed the failing beams, columns and ceiling trusses from the south side of the operation floor. It looks cleaner now. They also removed the wall panels on the east and west side of the southern end of the operation floor, so there is no more wall panel that had the letter "4" for Reactor 4 on the top floor on the east side. So the long story short, no it is not falling apart. It is unlikely that the portion of unit 4 that is no longer there fell off. More likely based on looking at images it was cut off. The marks where the remaining unit begins are clean breaks like they were cut rather than broke off. There is no rubble on top of the spent fuel pool. If all of this fell away during a quake in recent days there would be a pile of considerable rubble on top of the spent fuel pool. If you inspect the photos closely it is a nice clean cut and very tidy in the manner the rubble was cleaned off. 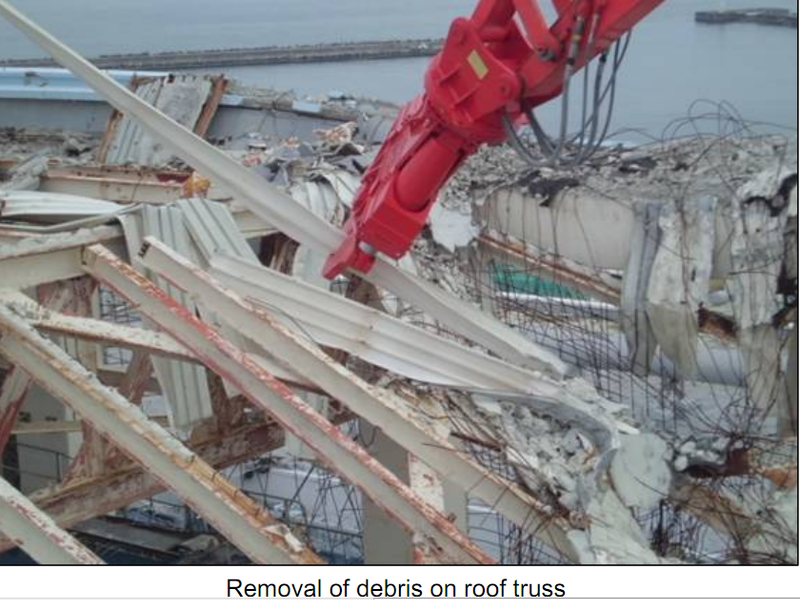 TEPCO did mention in earlier reports they were going to try to remove rubble at both units 3 and 4. Unit 3 has been plagued by high radiation levels. Workers at the plant have stated that the high radiation at unit 3 complicated the current attempt to remove rubble at that reactor. It is likely unit 4 was then cleaned off first. We do know that workers have been able to get up to the work deck of unit 4 and installed floating covers for the spent fuel pool. 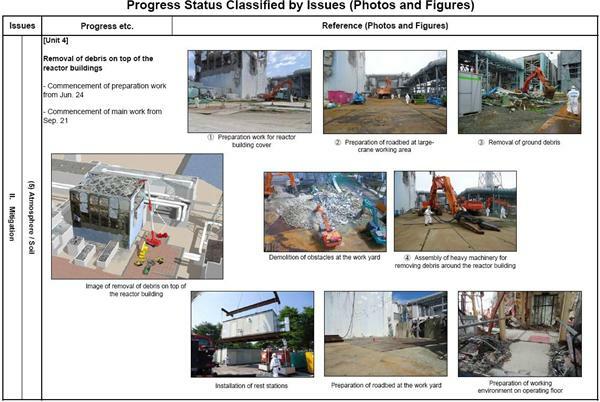 There is the TEPCO document from September 27th explaining they were installing the floating cover for unit 4′s fuel pool ahead of debris removal so this was well known it was coming. Wementioned this back in September.